Last September 13, 2014, more than a hundred volunteers from the GK Youth, Leyte Normal University, the local government unit of San Isidro, and GK Kapitbahayan (residents) planted trees in San Isidro, Leyte. But this was not your normal tree planting activity. The trees planted by the volunteers were donated by Manos Nail Lounge in Manila, as part of their loyalty card scheme and in time for their 3rd Anniversary. 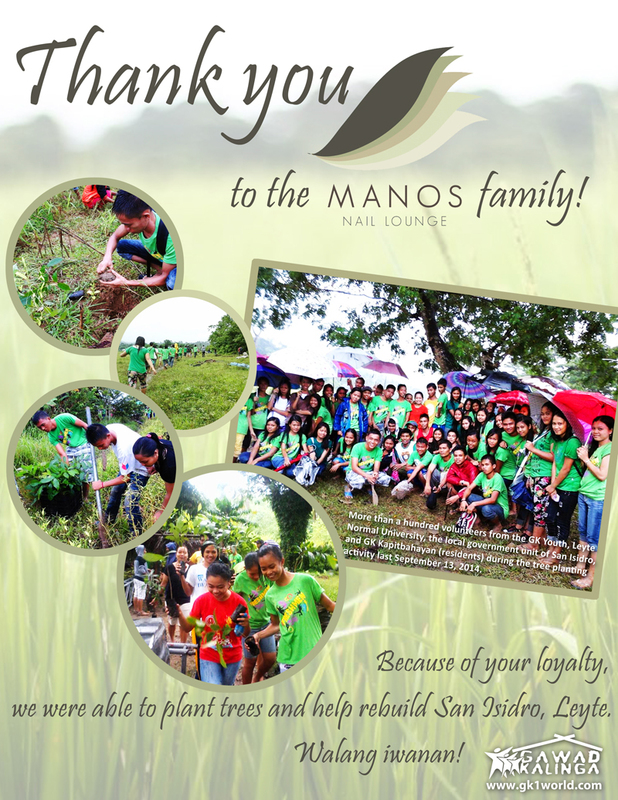 For every loyalty card completed by a client, Manos Nail Lounge adopts 1 tree in their name. This means that the bayanihan shown by the volunteers in Leyte mirrors the bayanihan of the many loyal clients of Manos Nail Lounge in Manila. Thank you to the Manos Nail Lounge family for helping rebuild San Isidro, Leyte. Walang iwanan! Manos Nail Lounge is a Filipino establishment that aims to make positive contributions to the community – and ultimately the country – through innovative ways one pair of hands (manos) at a time. They aim to reinvent the spa experience by building and promoting social and environmental consciousness through their products and services. The hands behind Manos are residents of Gawad Kalinga communities (among others), and Manos is committed to being fair and just to their employees, equipping them with the necessary skills to help improve their livelihood and foster a positive work ethic within the organization.